Everything movies, from latest reviews to latest trends, Bollywood and Hollywood, award season madness or just movie madness, all available on this blog. Everything about Gunday speaks the 70's. From its clap-trap dialogues and old school fighting scenes, to the best-friends-versus-the-world plot, you won't be mistaken if you start feeling like you've gone back in time to a 1970's single screen. The fact that the story and its characters are based in 1980's Calcutta only further evokes this nostalgia. And that is exactly why Gunday becomes so unbearable to watch. It's a mash up of every formulaic Bollywood potboiler that came out from that decade including Sholay, Deewar, Don, and Kala Patthar, truly giving 'been there, done that!' a whole new meaning. And if being so derivative wasn't bad enough, Gunday's screenplay is so lazily written that the film shockingly becomes boring to watch, something I didn't expect it would be given how energetic and charismatic the lead actors are. The film's plot is basically about Bikram (Singh) and Bala (Kapoor), two fierce youngsters who are refugees from Bangladesh. With circumstances being so horribly cruel, the kids resort to stealing and selling coal to make a living. They eventually grow up to become, for lack of a better term, 'Gunday'. Heading every illegal activity possible in Calcutta. Their antics grab the attention of ACP Satyajit Sarkar (Khan), a relentless cop who wants to take these gunday down hard and fast. Also in the mix is Nandita (Chopra), a cabaret dancer who both of our protagonists fall in love with. The film then becomes a tale of friendship, love, betrayal, and reunion for Bikram and Bala, with ACP Sarkar being right on their heels. The film shows some promise when it starts off, especially in the bits where Bikram and Bala are kids. But as our protagonists grow up from being boys to being men, it becomes perfectly clear that the film is going to take the tried and tested and so very predictable route that almost every film in this genre takes. The film then follows all of the cliches of a 70's Bollywood masala film to a tee. Even before Nandita makes an entry (or is it entriyaan now? ), we all know that there will be a love triangle in place (will movies ever stop using this as a plot device? can we move on to other shapes now? How about squares or circles?). As soon Nandita makes her entry, It becomes obvious that she will cause a rift between the two best friends. And as soon as a rift gets created (just like one would have predicted), it is perfectly clear that ACP Sarkar will use advantage of said rift to bring down Bikram and Bala. But its not just the lack of a surprise that doesn't work here, its also the unoriginal and boring way in which the film's director Ali Abbas Zafar executes these plot devices. The songs are a mess. They slow down the narrative of a film that is already alarmingly slow in the first place. Even the catchy 'Tune Maari Entriyaan' isn't able to do much. But to Zafar's credit, there is one twist in the film's plot that is surprising and original, one that most people would not see coming. And while that adds some much needed zing to the film, the follow up to this twist and where and how Zafar takes the film forward with this new dynamic takes away much of its brilliance. There is one silver lining though. The energy and charisma of our leads (for the most part), and the charming performances from the supporting cast. 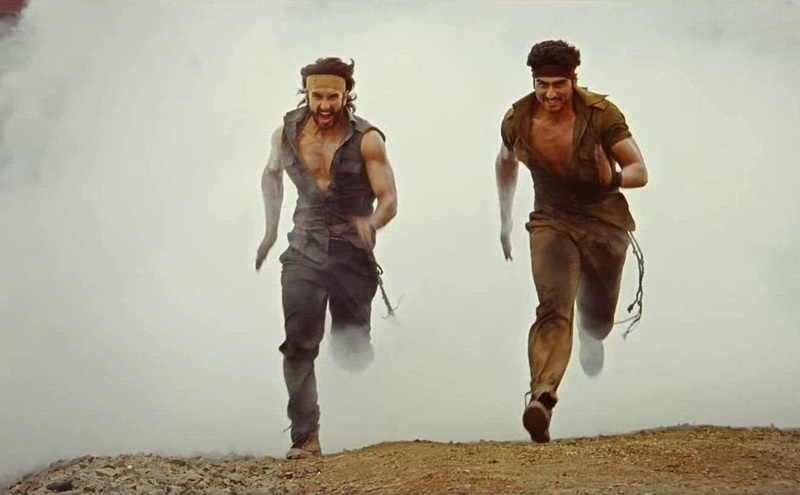 Both Arjun Kapoor and Ranveer Singh are required to be macho and energetic and that's exactly what they do. In the first half, they are filled with charisma and bubbling with energy. Both of the leading men do justice to the scenes where their characters are shown having fun. However this changes drastically when the film enters its 2nd half. While Singh still manages to play his character with some sense of sincerity, Kapoor is just downright laughable. In every scene that Kapoor tries to pull of his character's evil streak, he fails spectacularly. Instead of appearing menacing in critical scenes, he is comical. But Kapoor cannot be held entirely responsible for what we see on screen, as the character of Bala itself is so horridly written. Initially, Chopra's character appears to be lost and irrelevant and so her performance seems to be one note. But as the film enters its 3rd act, her character develops more layers, and as a result her performance becomes leaps and bounds better. She kills it in in two emotionally power packed scenes, one each with Kapoor and Singh, where her experience completely overshadows the new kids on the block. However its Irrfan who just steals the show. As the manipulative and tough talking top cop Satyajit Sarkar, Khan is effective and impressive. That he will come up with a good performance is pretty much expected, but he doesn't just give a good performance, he literally salvages the film from being third degree torture. Its no wonder then that he is the (only!) shining spot in the film. Gunday showed some potential in the start, but lost all of it within minutes. If anyone ever wanted to watch a marathon of famous Bollywood films from the 70's but didn't have enough time to watch all of them, they should go and watch Gunday, otherwise its just best to skip this one and save your time and money.